I wore this look last week for a lunch date with my sister and got SO many questions about where everything was from, so I thought I’d share all of the details with you today! Also, you might’ve seen that we escaped the cold & snow and are now in beautiful, sunny Maui!!! We love it here and have our favorite restaurants and places to visit, but if you have any recommendations for us let me know! I love that suede jacket! It is so chic! You rock this casual and elegant outfit, looking super stylish! I like your jacket and shoes very much. So stunning and effortless. You look lovely! We are getting married in Kapalua in September. I saw you are staying at the Montage, which is near the condo we are at. I would love to know all your recommendations for things to do and places to eat in Kapalua. I will definitely share our favorites with you! Congrats, that is so exciting! Love this look and color combo! We were in Maui for a Christmas break. We tried the brunch at the Ritz this trip and it was great! Macadamia nut pancakes, so yummy. You are so nice!!!! Thank you! Love that outfit combination, specially the purse. I love this outfit! The jacket gives it a cool girl vibe, but with all the light colors still very feminine! I love this jacket. You wear it so well! You neutral color combination is perfection! That jacket is so cute! I love the lace-up sweater you styled it with! Very chic look. Hi Rachel, Quick question, I just got my first pair of Louboutin’s pumps and flats. I am super excited to wear them, but I was wondering, do you protect the red sole at all? I have seen some different bloggers covering the sole with screen protectors, but that worries be about slipping. Let me know! Thanks! what an elegant and simple look! I so love that top! Beautiful outfit! LOVE this jacket, what a great find! Loving the textures of this look!!! The laceup sweater and suede jacket pair so well together! Ah this jacket is amazing! Love the color! So cute for any season :) Enjoy Maui! Seriously, I love it! And it comes in a variety of colors too! Gorgeous!! I love the lace up sweater and that jacket! Seriously loving that jacket and the lace up sweater – so chic! Saw you’re in Maui and man am I envious. Enjoy your time with family! Thanks so much, Holly!! We are already having so much fun! Ah, you’re sweet! Thanks Carmen! Love that sweater! You look so cool! Lovely coat. Enjoy your stay! I love everything about this look! Need it all! Adore this look! Perfect suede jacket! I’m so obsessed with those jeans! Have an amazing trip! Your outfit looks lovely here – love that sweater. What kind of camera and lens do you find yourself using the most? Your pictures always look stunning. For lifestyle or family photos I use the Canon Rebel with the 50MM 1.2 lens. For my outfit photos I use the Canon 5D Mark II camera. Hope this helps!! What a great layering piece! Love this look! Suede jacket looks great. Have an amazing time in Maui! Have so much fun!! The weather looks beautiful! totally buying this jacket!! thanks for sharing!! 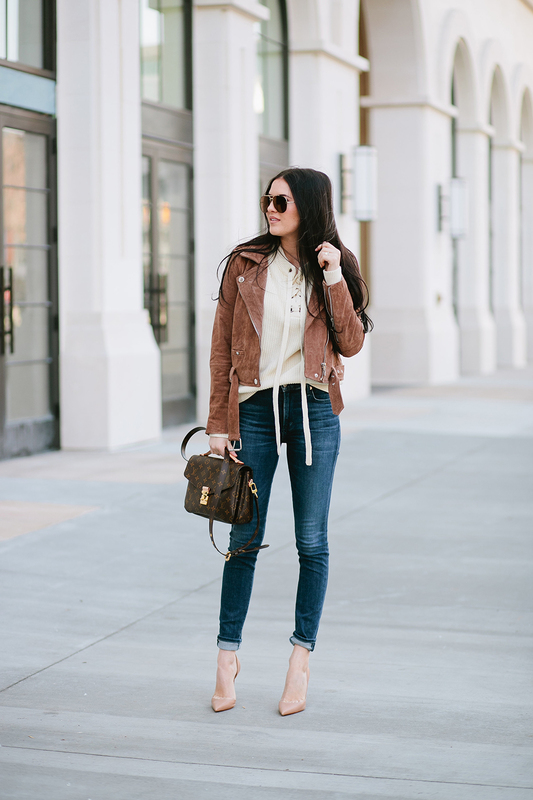 I think this is one of my favorite outfits I’ve ever seen on your blog!! Super classy and cute! <3 Have fun in Hawaii! 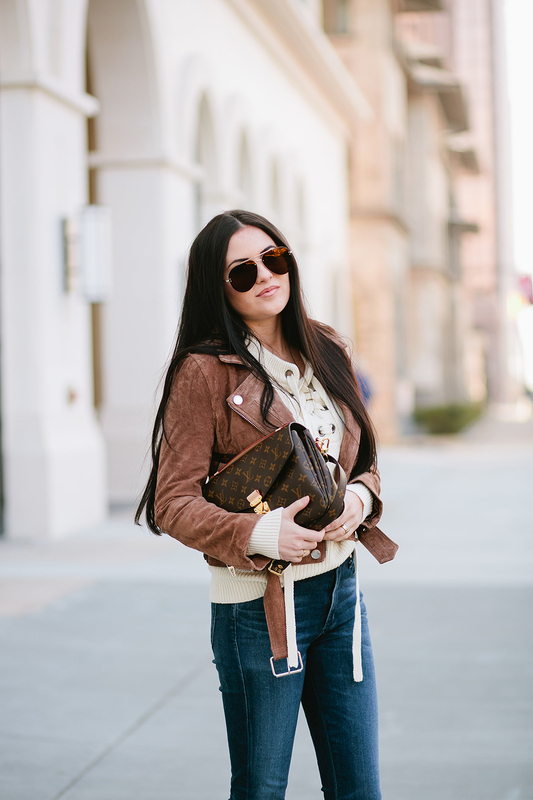 Love your suede jacket! I have pretty much the same one! 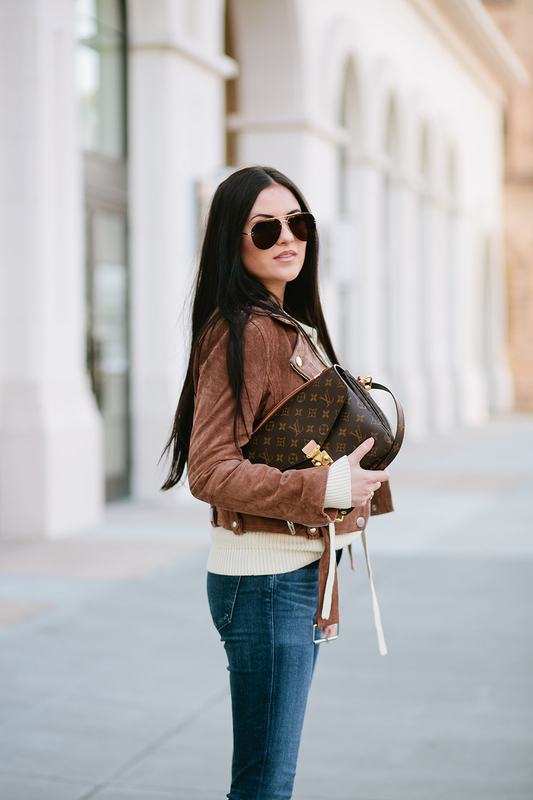 I have this suede moto jacket too… LOVE it! It look great on you!